The low single digit return noted above is far below the return the market generated in the 20 year period that began in 1980 and ran up to the technology bubble in 2000. 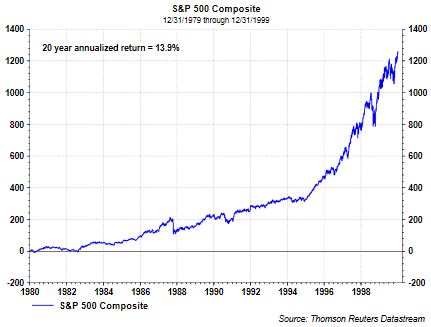 The annualized price only return for this 20 year period equaled 13.9%. 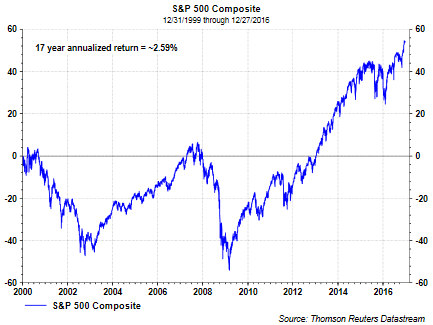 In spite of the strong equity market return since the financial crisis and more so since the election, the 2+% return is far below the near 10% annualized return the S&P 500 Index has generated going back to 1928. 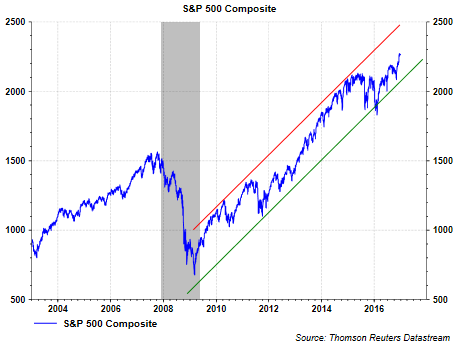 With earnings growth for the S&P 500 companies resuming in the third quarter at 4.3% versus the third quarter of 2015., this earnings growth acceleration is one factor likely to serve as a tailwind for stocks. For all of calendar year 2017, earnings growth for the S&P 500 Index is projected to equal 12.5% as reported by Thomson Reuters I/B/E/S. And lastly, from a technical perspective, the index remains in a longer term uptrend, and all else being equal, could be sustained into the new year.